One of the first things people often ask about The Linda Theater is how it got its name. The answer is pretty simple: local builder and developer Ernest Alessio named it after his daughter. Assisted in the design and construction by his sons Lino and Reno, Alessio created a landmark that is not only closely identified with the surrounding neighborhood, but known throughout Akron. The stretch of land along Goodyear Boulevard where The Linda resides was always intended to be set aside for mixed use (commercial & retail) development; in fact original plans by Frank Seiberling’s architect show a large, attractive Tudor-style building with apartments above and shops at street level. Due to the recession of 1921, it was never built. Over the years, a number of small frame buildings appeared here, including some grocery stores and confectioners, hardware stores and a pharmacy. Goodyear Heights Baptist Church laid claim to the north end of the block. After WWII, there was building boom in The Heights as GIs returned from the war. In 1948, Alessio purchased some properties on the block and built the Linda to serve the growing neighborhood. An experienced general contractor who built other Akron buildings like the Federal Building and the old Akron Library, Alessio designed The Linda himself after rejecting an expensive architect bid. Son Reno managed the theater for many years and daughter Linda served at the concession counter. 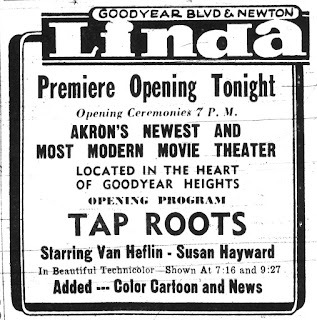 Opening night at The Linda was a big hit, featuring the film “Tap Roots” – starring Van Heflin and Susan Hayward. Billed as “Akron’s Newest & Most Modern Movie Theater” it featured 500 seats, an advanced projection system and of course—air conditioning. 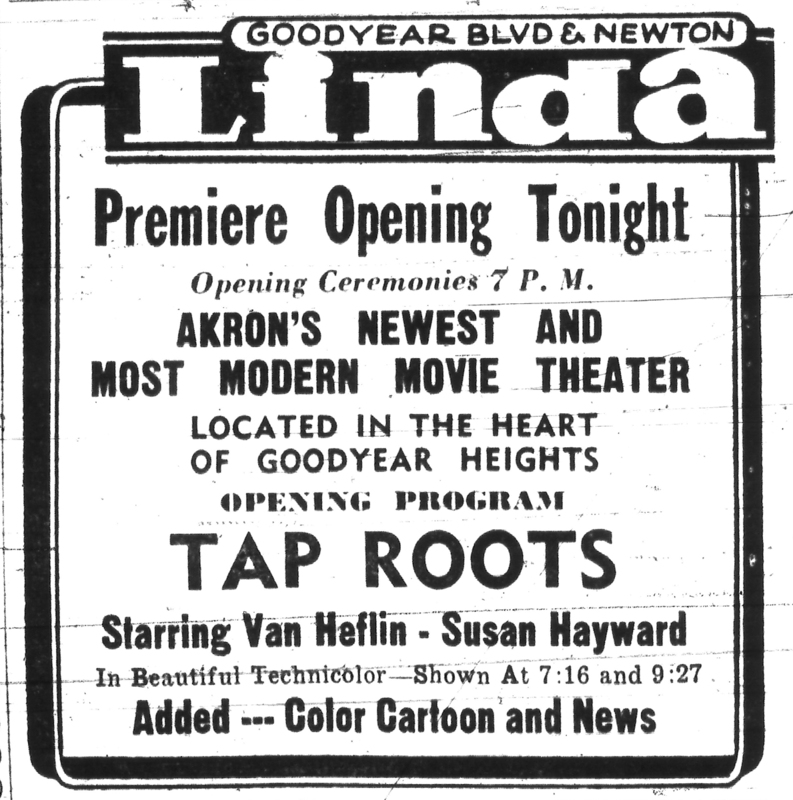 For almost 7 decades, the theater has entertained generations of Goodyear Heights and Akron residents, and has been successfully operated by current owner Ted Bare for many years. The theater continues to play feature films after they have finished their initial runs at major show houses—which allows big savings on ticket prices. In 2008, the R.I.G.H.T. Committee hired Akron artist Brian Parsons to create a large mural on the east side of the building, facing the Boulevard. It features historical, architectural and scenic images of Goodyear Heights from the last 100 years.